Joel Sked: The nosedive Hibs have taken since thumping Accies 6-0 in October is perplexing. Systems and personnel have been chopped and changed, partnerships and relationships on the field have deteriorated. The Easter Road side are in a rut. Dundee and St Mirren presented perfect opportunities for Neil Lennon’s men to flex their muscles and find their confidence again. The four points drop could prove costly. Opponents Hamilton are a rabble. Okay, they are capable of pulling off a result every few games, but defensively they are the worst in the league. It might not be pretty, but Hibs to win. Anthony Brown: Hibs’ winless run can’t go on forever. They have too much quality in their squad to continue playing as poorly as they have been recently. Slip-ups at home to both of the bottom two sides over the past fortnight have been alarming for the Easter Road support, but Hamilton, having been thrashed 4-0 at Dundee on Wednesday, could be in an even more fragile state than their visitors this weekend. Prediction: Away win. Mark Atkinson: A December visit to Hamilton’s plastic pitch is never appealing no matter what form you are in. Hibs are going to find it tough against a team that with scratch and claw their way through this game. I worry about Hibs in midfield here – Darian MacKinnon, Scott Martin and Tom Taiwo will be in their faces the whole time – and Accies will have a point to prove after losing so comprehensively to Dundee last time out. It’s evident that Hibs have the better team on paper, but their confidence is low and they just can’t keep the door shut at the back. I can see Hibs getting a draw, but the wait for a win could well go on. Craig Fowler: Hamilton surprise you when you least it expect it, both in a positive and negative sense. Therefore, seeing as they’ll be looking to cause a shock this weekend by taking advantage of a Hibs side current locked in a tailspin, I’m predicting a comprehensive away victory. Look for a response from Florian Kamberi after the player was called out by the management team following Wednesday’s draw against St Mirren. Prediction: Away win. 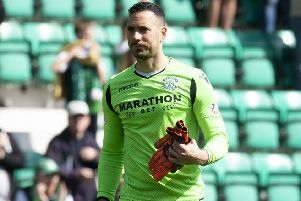 Patrick McPartlin: I backed Hibs to beat both Kilmarnock and St Mirren, and we all know how that ended up. Despite that, I reckon Hibs have enough in them to record a much-needed victory on the road. Hamilton have shipped 12 in their last four games including two 4-0 reversals; the most recent on Wednesday night against Dundee. Neil Lennon’s side had enough chances to beat St Mirren and with Accies the holders of the Ladbrokes Premiership’s worst defensive record so far, I can see the Capital club winning this one by the odd goal or two. Prediction: Away win. Neil McGlade: The search for that elusive win continues for Neil Lennon’s men at Hamilton this afternoon. Ironically, Accies were the last team to lose to Hibs – a 6-0 thrashing at Easter Road at the beginning of October. Oh how the tide has turned. The Hibees have completely lost their momentum in recent weeks, some players more than others. Assistant Garry Parker, who has assumed media duties over the past week or so, believes it may just take a lucky break to get back on the winning trail. In truth, Hibs fans will take anything at this moment in time. Another huge 90 minutes beckons in North Lanarkshire. Accies are poor, but I fancy Hibs’ miserable run to continue. Home win.